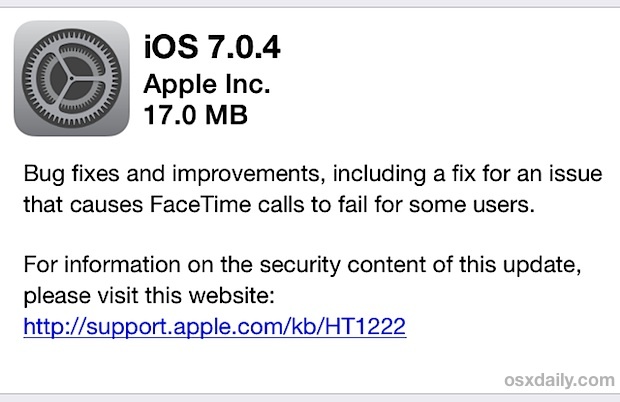 iOS 7.0.4 has been released by Apple for compatible iPhone, iPad, and iPod touch models, with a build of 11B554a. The update includes several bug fixes and improvements, and addresses an issue with FaceTime calling that caused video chat and voice calls to fail continuously under some circumstances. Other small feature changes may be present, but have not been specifically mentioned or discovered yet. The iOS 7.0.4 update is small but users are still advised to backup their iOS devices to iCloud or iTunes, if not both, before installing the update on their respective hardware. The update is available for iPhone 4, iPhone 4S, iPhone 5, iPhone 5S, iPhone 5C, iPad 2, iPad 3, iPad 4, iPad Air, iPad Mini, Retina iPad Mini, and the iPod touch 5th gen. Additionally, iOS 6.1.5 is available for the iPod touch 4th gen, which resolves the same FaceTime issues for that device. Users must be on a wi-fi network to be able to download the update through OTA, despite the delta update size being about 18MB. It may sit on “Preparing Update…” for a while before completing, this seems to be routine for just about every iOS device, just let it sit and it should complete eventually. Another option is to connect a device to a computer with iTunes and download the complete update through there. Experienced users who are comfortable using firmware files can also choose to download IPSW files directly from Apple’s servers using the links below, then apply the update manually through iTunes. This is generally considered more advanced and is best reserved for those who have experience with updating through IPSW. For best results, right-click the respective link and choose “Save As”. Be sure the file has a “.ipsw” extension when saved. The majority of individuals should use the OTA update method, it is by far the simplest. The update appears to enable Bluetooth, so if you don’t use the feature be sure to turn that off when your device reboots. Disabling unneeded features can help battery life last longer on just about every iOS device. Any new advice yet about updating to iOS 7 or not updating to iOS 7 for an iPhone 4? I have two iPhone 4s that I upgraded without issue. The phone is ever so slightly slower but they ran fine. I only had one report at work that it ate batteries but this may have been due to excessive Facebook use. My opinion is that if you’re happy with iOS 6 on the iPhone 4, stay with iOS 6. iOS 7 runs “OK” on the iPhone 4, it’s usable, but it’s really not an optimal experience because some of the features and effects are not supported. I updated my iPhone 4 and it’s been OK. Make sure to disable background app updating and blurring/motion effects. Have found battery life a little better than iOS 6 and have had no problems over the past few weeks. What the hell. I had JUST downloaded the HUGE 7.0.3 ipsw a few days ago in an Internet Cafe (I don’t have broadband here as I’m on vacation), and the SECOND I want to install it, Apple stops signing it and releases 7.0.4!!! I have iPad 2 WiFi 64GB, which ipsw should I get?